The collapsible non-potable water tank is the perfect option for storage of various types of gray water. Made with a flexible, yet robust material, these tanks are equipped to successfully store brine water, process water, production water, rain water, wastewater and more. Due to their low profiles, these tanks have also been frequently implemented for utility water storage to supply sprinklers, washers, and more. The gray water storage tank is designed to store almost any non-potable water source, making it extremely versatile. Depending on the demands of your location, tanks are typically built with either a 1 year, 3-5 year or up 7 year contact time. This equips the tank for short or long term storage, as needed in your location. Give us a call at +1-772-646-0597 or fill out our quote request form to discuss your collapsible tank requirements. While the table below feature some of our typical tank sizing, the collapsible tanks are some of our more flexible storage options and can be easily adapted to custom length or width requirements. If you are dealing with a space slightly different from the sizing featured here, please do not hesitate to contact us with your specific size requirements. Give us a call at +1-772-646-0597 or fill out our quote request form to discuss your collapsible water tank requirements. In addition to small gray water storage requirements, these collapsible water tanks have also been frequently used in areas with large industrial water storage requirements. This has included locations looking to store large quantities of frac water, process water or brine water for use in their site's applications. 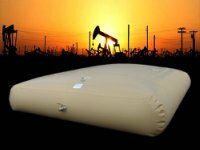 Fabric: The fabric used for these collapsible water tanks can varying depending on your specific site conditions or liquid storage requirements. Typical fabric materials includes polyurethane, polymer alloy and E PVC coated fabric. These materials are designed for rigorous environments and can store non-potable materials. Fittings: Standard fittings are built to accommodate hoses and include ball valves, pressure relief vents and caps. These fitting typically range from 3/4 to 2 inches (3/4" to 2") though larger sizes including 4 through 6 inches (4" through 6") are also available. Standard materials you will find being used for these fittings include aluminum, stainless steel, and polypropylene.